Sky Sports GAA reporter Damian Lawlor has a unique take on big match days. Damian Lawlor goes through his notes. IT’S NOT ALL glitz and glamour on live TV, you know. Tipperary native and Sunday Independent GAA writer Damian Lawlor is a key member of the Sky Sports team and well known to viewers all over the country and abroad. He’s the man who’ll bring you pre-match team news and interviews, a half-time update and post-match reaction. Hailing from Kilruane in the Premier County, Lawlor and his family are steeped in the ways of the GAA. The four-time author’s tomes include the critically acclaimed autobiography of current Wexford hurling boss Liam Dunne, I Crossed the Line. Lawlor also wrote Fields of Fire: The Inside Story of Hurling’s Great Renaissance, Tipperary hurler Lar Corbett’s life story All In My Head and the groundbreaking investigation into the workings of the Waterford senior football team, Working on a Dream. 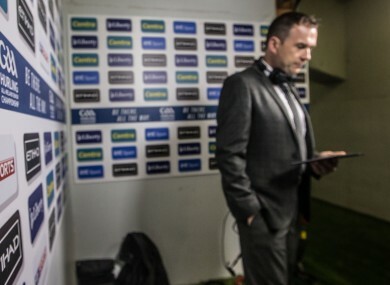 A regular radio and TV analyst and former presenter of Take Your Point on RTÉ Radio One, Lawlor has been working with the Sky Sports GAA team over the last two summers. “I’m new to TV. Setanta gave me a break presenting their hurling and football League coverage this year and last year and with Sky, I’m getting more experience over the last two seasons,” he explains. “I absolutely love the challenge. “After 16 years in print journalism and having written four books, it’s totally different. “Sky are great to work for and it’s very much a team effort. “The people that guide me most are producers Ciaran O’Hara and Dave Lawrence, and director Sean Randall. Damian Lawlor gets ready for action. Lawlor’s own interest in the GAA was spawned as a young boy, when former Tipperary hurler and manager Nicky English gave him his first ever autograph. “My Dad John gave 60 years of service to Nenagh Eire Og, Kilruane MacDonaghs and Tipp,” Lawlor adds. “He received a lifetime award from the Tipperary county board in February for his service and while he was in hospital recently many GAA figures called to see him, including the Munster chairman Robert Frost, which shows how people look out for each other. A typical day for the Sky Sports GAA team is pretty hectic, as Lawlor explains. “Sky Sports are extremely professional. For me, the day starts at 2pm ahead of a 7pm throw-in but the crew and production team are there long before that. “Rehearsals take place at 3pm and while the presenters, analysts and crew are doing their jobs, I am moving around the ground and beyond the tunnel trying to gain any snippets of information that I can. “I spend the afternoon trying to gain an insight into team selections, line-ups and tactics. “Sometimes managers will stop to shoot the breeze but often they’re wired to the moon. “I was at Wexford Park for the recent Cork-Wexford qualifier and I would know the Wexford manager, Liam Dunne, well having written his autobiography. “I had been in Whites Hotel in Wexford on the previous weekend for cryotherapy on a back problem. “He stopped for a second. ‘If we lose, I’ll be in the cryotheraphy chamber with you tonight!’ he joked. “Last Saturday, before the Cork and Clare game, I was conducting pre-match interviews with Jimmy Barry-Murphy and Davy Fitzgerald, the managers. “The Cork backroom staff were gathered around our TVs to see if the Dublin-Limerick game would go to extra-time. “They were eager that it wouldn’t as their preparations had been tailored specifically to getting out on the pitch at a certain time. “When the game begins, I’m in the tunnel or on the sideline, keeping an eye out for any developments. I’m in constant touch with the producers Dave and Ciaran during the game and at half-time, I have 30 seconds to provide a quick update. “This information has to be useful and insightful. For example, at the recent Wexford game I was able to show how three Wexford players taken off in the first half were being comforted by their families on the bench while everyone else went into the dressing room. “Last weekend was very interesting. I could see that Clare were bringing in Aaron Cunningham and that John Conlon was being taken off at half-time. “The Clare management team huddled together for a period of time and then called Conlon out into the corridor to tell him the news. “The Cork management team was in a separate huddle at the other end and it was fascinating to see this tactical game of chess playing out. “Post match interviews are generally straightforward with winning teams but naturally, can be difficult for the losers. All the while, Lawlor’s every move is being monitored by Denis Byrne, a floor manager who worked on the Late Late Show for 25 years, and sound engineer Stephen McLoughlin. “Robert Ryan, the security man at Semple Stadium, is another man without whom I wouldn’t be able to survive. “Robert would stand on his head for you and has helped me out with everything from car parking to clipboards. Email “'Three Wexford players taken off were being comforted by their families'”. Feedback on “'Three Wexford players taken off were being comforted by their families'”.